In a strong defence of India’s vote at the IAEA, Prime Minister Manmohan Singh today assured both Houses of Parliament that his government’s stand was based on “objectives of upholding Iran’s rights and obligations” and country’s “security concerns arising from proliferation”. 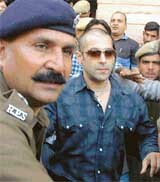 Bollywood star Salman Khan was today sentenced to one year imprisonment and fined Rs 5,000 by a court here after finding him guilty of killing a chinkara, a deer species, at Bhavad village in this Rajasthan district in 1998. Should there be an Indian Institute of Science in Punjab? Adding a new dimension to the anti-Denmark protests, an Uttar Pradesh minister today declared a cash reward of Rs 51 crore for the person who would behead the Danish cartoonist who drew the controversial cartoons of Prophet Mohammad. With weeks left for the Assembly polls to five states, including West Bengal and Kerala, the Left parties today raised their pitch against the UPA government by warning the Manmohan Singh government to cross the national common minimum programme “Lakshman rekha” at its own peril. The Left parties and the Congress, who are pitted against each other in the forthcoming Assembly elections in Kerala and West Bengal, are presently engaged in a cat and mouse game with each other. The government is likely to find it hard to implement the recommendations of the Rangarajan Committee that has recommended a steep hike of Rs 75 per LPG cylinder, besides Rs 1.21 per litre for petrol and Rs 1.96 a litre of diesel. Mr Rangarajan submitted the report to Petroleum Minister Murli Deora here today. Rural Development Minister Raghuvansh Prasad today blamed the Punjab Government for reported drinking water crisis in the Malwa belt, especially in the Bathinda-Mansa belt where cases of cancer due to unsafe drinking water have come to light. Though over 120 Gurs of over 230 devatas gave their verdict against the proposed $150 million Himalayan Ski Village in its present form at Naggar yesterday, the HSV company is pining its hopes on local deities.